Want the place to yourself? Our full daily service for 2019 will comence on Monday 18th March 2019.. Living locally we are able to offer first class holidays. We have encyclopedic knowledge of all local walks, services and great places to eat, also good knowledge of accommodation providers and what can be offered. Holidays designed for you. Check out our excellent E-book that gives all the information you need to plan your walking trip. Including recommended accommodation, comfort stops, local buses, tides and plenty of other local information. Walkalongway, we have 10 years experience helping you get the very best enjoyment when out and about exploring our beautiful West Wales coast and countryside. We pride ourselves on our local knowledge. Our new Dog Walking and more Pembrokeshire Coast Path holidays are added this year to our growing holiday list. 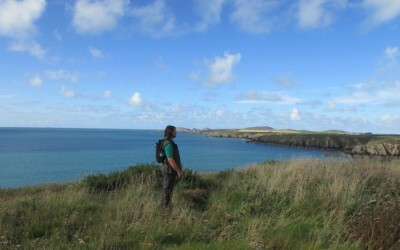 Walkalongway are joint founders of Wales Coastal Path Walking Holiday Providers Association. Learn more about us in this video. It was a BIG contribution to the enjoyment of our walk, AND A JOY to have met at Llangrannog. After last years transfer service for me you “saved my life”, because you discovered that i had forgotten to book one accomodation. Thank you for your EXCELLENT SERVICE. It is such a relief to know that your bags will be waiting. We had a great time walking and were grateful for your excellent support. For walking and camping trips. We transfer your luggage along the Pembrokeshire and Ceredigion coast paths, leaving you to have great days out without worrying about your bags; knowing they’ll be waiting at the end of the day. 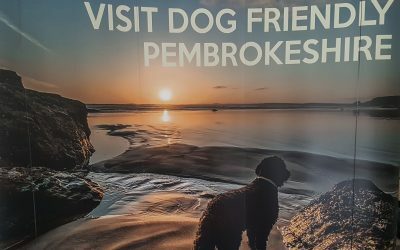 PEMBROKESHIRE TOURISM AWARDS FINALIST 2018 - Dog Friendly Walking holidays in Pembrokeshire Marketing Campaign. "An excellent idea to bring every member of your family on holiday"